I almost finished to develop Take Something Literally 2 but I would like to add some special rewards. 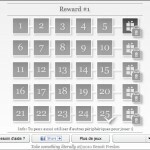 Actually i’m looking for 5 funny rewards: 1 reward if you complete 5 puzzles. (see the screenshot). As you can see with Take Something Literally 1 I try to create original puzzles with original rewards. I’m looking for youtube videos, please post a comment with your link(s). Try to find an original funny movie: no advertising, no copyrighted movie, no more 3 min.